Rhinoplasty surgeons are striving to respect ethnic nasal variations realizing that patients typically want to refine their nasal appearance yet preserve their ethnic features. This respect serves to maintain facial harmony among the esthetic units and tends to achieve a natural look. Disclaimer: it is overly simplistic to classify a non-Caucasian nose as an “ethnic” nose to which “ethnic rhinoplasty” principles apply. Two noses from two different ethnic backgrounds are likely to be as different from each other as they are from a Caucasian nose. In addition, significant variations in facial features are found within any given ethnic group. That being said, three broad nasal morphology types have been used to describe ethnic variations. The leptorrhine (“tall and thin”) nose is associated with Caucasian or Indo-European descent. Because it is the most extensively studied in modern nasal analysis, it also inevitably becomes the reference point for comparison when studying noses of different ethnicity's. Only recently have non-Caucasian standards of nasal analysis been developed for specific ethnic groups. The platyrrhine (“broad and flat”) nose is associated with African descent. It is characterized by thick skin, a low radix, a short dorsum, a bulbous and underprojected tip, and flared nostrils. An analysis of the African-American female nose shows that compared to the Caucasian standard for nasal analysis, the columella-to-lobule ratio is decreased, and the alar width relative to the intercanthal distance is increased. 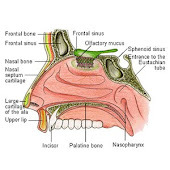 The mesorrhine (“intermediate”) nose has features intermediate between the leptorrhine nose and the platyrrhine nose. The “typical” Asian or Latino nose is commonly regarded as mesorrhine, with a low radix, variable anterior dorsal projection, rounded and underprojected tip, and rounded nostrils. In Dr. Kim’s practice, patients of different backgrounds tend not to want to strive for measurements and metrics consistent with a Caucasian leptorrhine nose. Rather, many patients prefer to soften certain features of their nose while retaining some of their “ethnic identity”. Chapter 13 Revision Rhinoplasty of the ethnic nose .Dr. Jennifer Parker Porter & Chapter 14 Asian Revision Rhinoplasty. Dr. Jeffrey M.Ahn & Dr. Jeffery C. Liu.